Shortpacked! - Blog - The circle is now complete. Everyone remembers Star Wars Transformers! I know this because a decade ago everyone told me about them every six seconds. Anyway, Star Wars Transformers is dead. Long live Star Wars Transformers! The original line was one of Hasbro's few attempts to do transforming toys on their own without Takara. Usually Takara works with Hasbro to engineer these effers, but for the original Star Wars Transformers, Hasbro's like "we got this." They didn't got it! I mean, they sort of got it. Technically, the toys transformed from robot to vehicle and back. But engineering transforming robot toys is a heckuva learning curve, and Takara worked through most their kinks a long while ago, while Hasbro was just getting started. You know that adage about how every artist has 10,000 bad drawings in them and they gotta get them out first before they can get to the good drawings? Well, Star Wars Transformers were Hasbro's first few dozen drawings. 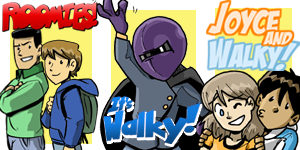 Anyway, it's 2018, and it's TakaraTomy's turn! I believe I read that TakaraTomy was all scheduled up with engineering transforming robot toys at the time of the original Star Wars Transformers line, and they kind of regretted not getting into that game themselves. And so they're doing it now, themselves! First this Darth Vader Tie Advanced toy and in a month or so we're getting another Millennium Falcon made out of Han and Chewbacca. 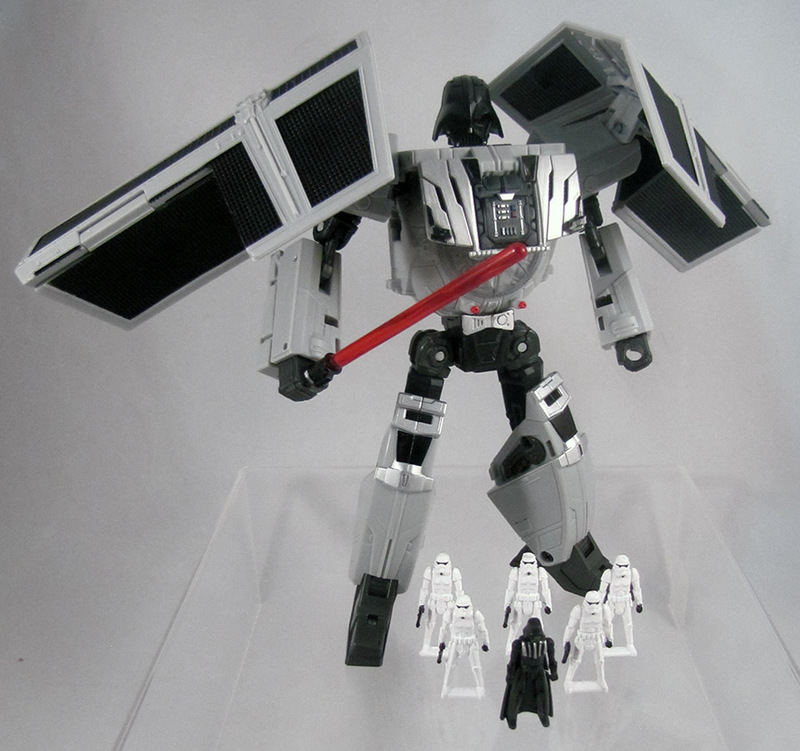 And let me tell you, as Hasbro-y as those first SWTFs were, TakaraTomy's Darth Vader is... kind of TakaraTomy-y. I mean, he's no Robots in Disguise Side Burn or one of those Transformers Go! combining guys, but parts of him sure get in his own way like those toys often did. 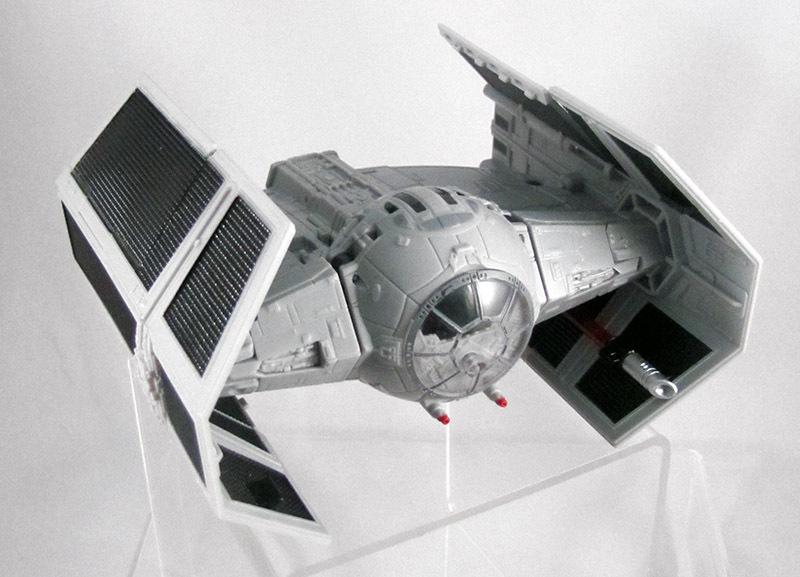 Like, the TIE advanced wings perched the robot mode's shoulders... those just don't have a placement that looks nice. And if you try moving the arms around into battle poses, the wings just start trying to clip through the torso (or the arms themselves) at any opportunity. They're kind of a mess. The rest of the toy is pretty simple, so that's nice! I have a feeling New Vader would be even more of a mess if it weren't for licensing terms -- I imagine Lucasfilm/Disney/whoever probably had some guidelines on where engineering could put transformation seams on the vehicle mode. Like, with car licensing, sometimes they're like "okay you can't have fold lines down the hood, OUR HOOD IS ICONIC, OKAY" and so you end up with a giant unaltered car hood somewhere (usually the chest). It's possible Star Wars is similar with the TIE Advanced, I dunno. New Vader comes with a light saber which the robot can hold and the vehicle can stow on its wing. There's also a tiny Vader figurine which can be placed inside the cockpit and five bonus Stormtrooper figurines. If you're cool with the awkward wings, New Vader is a pretty okay toy. 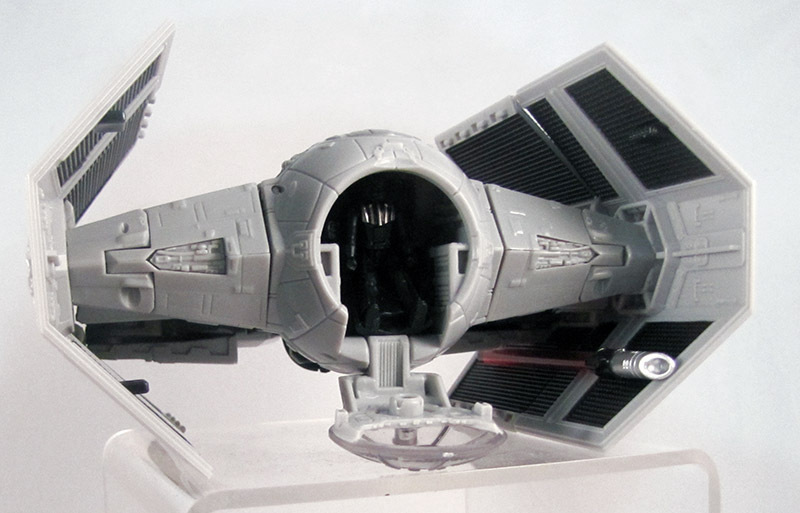 I mean, it's a giant Vader mech that Darth Vader can pilot, which transforms into Vader's TIE fighter. There are few things more rad.